For outdoor and indoor advertising, full color large format printed vinyl banners are an affordable way to go. But what do you need to know about the finishing options? There are many choices available and really depend on where the the banner is going to be displayed and how big the banner is. Grommets can be added to provide different hanging options.For outdoor banners use grommets with teeth. Typically grommets are placed every 18 inches around the perimeter of an outdoor vinyl banner offering hanging points for rope or cable. Reinforced webbing, similar to seat belt material, is welded onto the the outer edge of the vinyl to prevent the grommets from pulling out. Grommets come in silver, brass and black at are available in many different hole sizes. Pole pockets can be welded or stitched on the top and bottom of the vinyl banner to allow for hanging evenly from the top with a dowel or pipe conduit and another dowel added for weight on the bottom to keep the banner straight and smooth. Plastic clips can be attached to the top and bottom of small to mid sized banners for interior hanging. Adhesive plastic hanging tabs can be adhered to the vinyl banner as an anchor point for screws or rope. Wind slits, half moon shaped cuts in the vinyl, can be added to vinyl banners to help reduce the pressure of the wind on the banner. The number and size of the wind slits vary. Most city ordinances require street banners to have wind slits to prevent them from tearing. No amount of wind slits can prevent a hurricane from blowing any banner down however. Anchor points on the building, structure, telephone pole or whatever else you are using to support your outdoor banner are extremely important and usually will need an engineers certificate for approval. 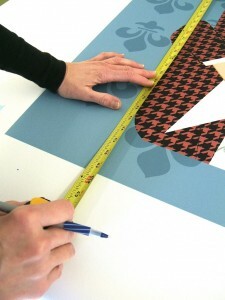 Vinyl banners can also be treated with firesafe chemicals to make them flame resistant.